My friend, Cat, invited me to a cookie swap last night and I’m never one to turn down a cookie swap. All the ladies were so much fun and the food was great (I think the stars of show were the homemade heart-shaped marshmallows and mexican hot chocolate made by the host… amazing)! 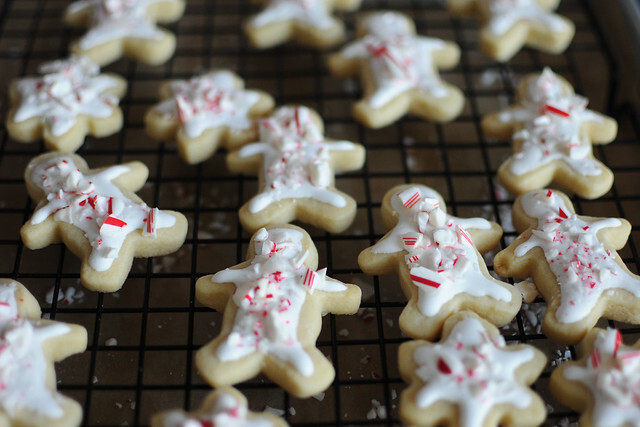 For the cookie swap, I decided to make these fun and festive peppermint butter cookies, which are butter cookies topped with royal icing and crushed candy canes. It’s hard to tell in the pictures, but these are really small cookies. I used about 2-inch cookie cutters and I like my small gingerbread man and snowflake cutters the best for these. The butter cookie dough is sturdy and easy to roll out and cut. If the dough gets sticky or too soft during the process, I just stick it in the fridge for a few minutes to firm up again and then pick up where I left off. 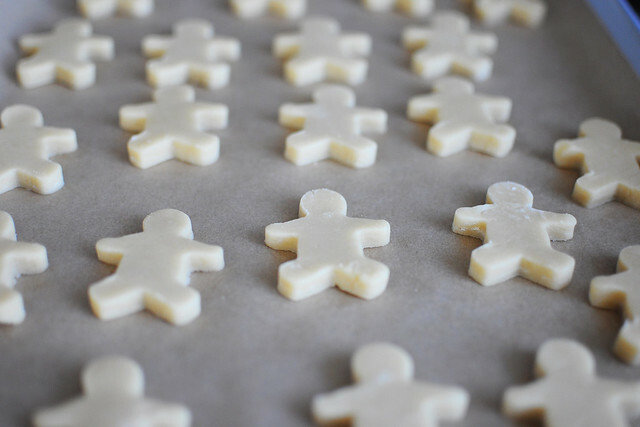 When they look this cute even before they are baked, you know the end result is going to be good! An added bonus to making these cookies is that when they are in the oven, your home fills up with this wonderful warm, sweet, buttery aroma–it’s heavenly. Also, just to caution you, these cookies are best when they are taken out of the oven right before they start to get any color or else they will get too dry and not have that wonderful shortbread texture that you’re after. You want to take them out just before the edges start to turn golden. Once the cookies are out of the oven and have cooled, you can start icing them. I used a homemade piping bag (aka a ziploc bag with the tip cut off) to ice mine. My piping skills aren’t that great, but luckily the crushed candy canes sprinkled on top help hide any mistakes. 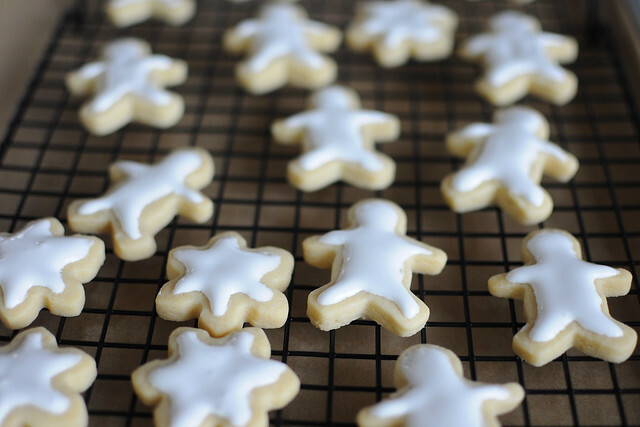 So if you’re worried about your piping skills, no worries–you can totally make these too! My wonderful mother-in-law and sisters-in-law got together this past weekend to make Christmas cookies and I wish I could’ve been there with them. It was great having a (super fun) cookie swap to go to while I was missing home and family. Thanks Cat for the invite! Looking forward to traveling North for Christmas in a few days. In a large bowl, beat the butter and sugar until light and fluffy. Beat in the egg yolk, then add the whole egg, salt, and vanilla, and stir to combine. Gradually stir in the flour. Once the dough comes together, form the dough into a flat disk, wrap in plastic wrap, and refrigerate for at least 30 minutes (or up to a day). Preheat the oven to 350 degrees with the oven in the upper-middle and lower-middle positions and line 2 baking sheets with parchment paper. On a clean surface, roll out the dough to about 1/4 inch thick (flour your surface and rolling pin or roll out the dough between 2 pieces of plastic wrap). 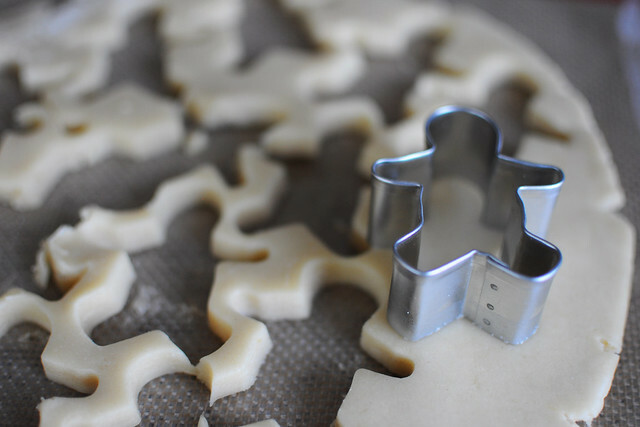 Use a small cookie cutter to cut out the cookies, place them on the prepared baking sheets, and chill in the refrigerator for about 10 minutes until the cookies have firmed up (this will help them keep their shape as they bake). Bake for about 15 minutes, until the cookies are just beginning to turn golden on the edges (don’t actually let them turn golden or else they will be over-baked). Transfer to a rack to cool completely. Make the royal icing by beating the powdered sugar, meringue powder, and water with a stand mixer on low for about 10 minutes until the icing is glossy and forms stiff peaks. Transfer icing to a piping bag or squeeze bottle and ice the cookies. 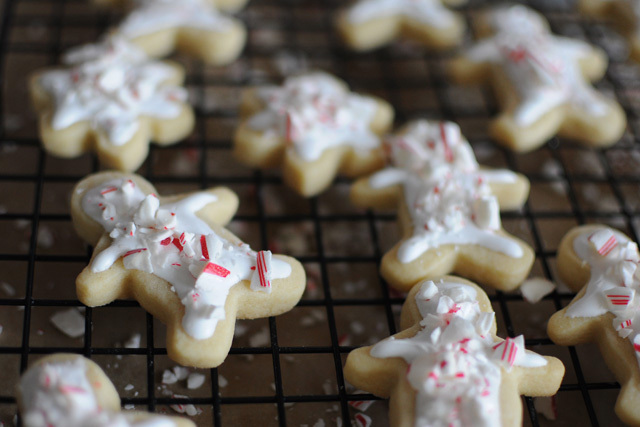 Before the icing sets, sprinkle the tops with the crushed peppermint candies. Makes about 6 dozen 2-inch cookies.